The 50 foot schooner 'Lola' is a charming sailboat designed by Frans Maas, in very good conditions and fully equipped, with a solid structure and a sharp bow that cuts through waves. She can comfortably accommodate 8 persons in 4 cabins, 2 double and 2 single with 2 berths. We have been living during the last ten years on board in the Caribbean. The boat has been lovely sailed and maintained by us and she is ready to sail. We have just bought a new mainsail and 60 mts of new anchor chain. The deck was completely painted last year. 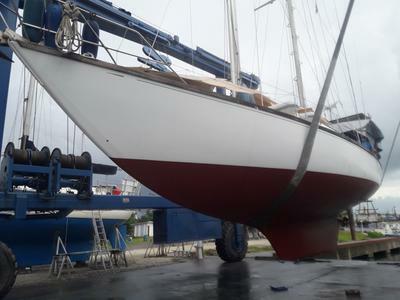 The rigging, hull, engine, sails, boat structure and interiors are well maintained and in good conditions. 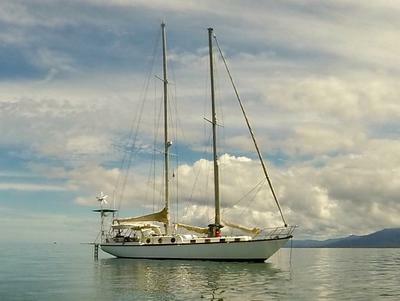 The reason why we are selling the boat, is because we need to go back home, as a result of some sudden family issues. The boat was built by the Dutch designer Frans Maas in Nice by request of a French couple who wanted to sail around the world in a steady and seaworthy hull. This was in 1989 and the boat was launched in 1990. 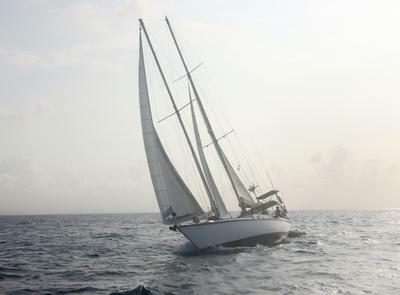 The first owners (the French couple) started sailing the Mediterranean for 3 years before arriving to Mallorca in 1994 where they finally separated. We bought the boat in 2000, after falling in love with her hull shape. At that time, we were looking for a solid boat of this characteristics. So, 'Lola' has had only two owners from new. Engine:Solé Mini 62 Mitsubishi / Max Power: 59.0 CV / Max. RPM: 3000 / Cycle: 4 / No. Cylinder & Arrangement: 4 in line. The engine was refitted in 2017 with a new inverter and injection pump and completely revised. It is a strong engine, easy to work at and maintain. Four cabins with berths for as many as 9 persons. From bow to stern: there is a large cabin in the bow with a double bed. Moving aft, there is a private cabin with a double bed to port and another with two single berths to starboard. All the way aft there is a private cabin with two single berths and separate access to deck. The main salon features large U-shaped seating with ample storage beneath around a varnished wooden dining table - which can be lowered for an additional double berth. One bathroom with Jabsco Electric Toilet. I was onboard for 2 days. Amazing Boat in very good conditions, with wonderful owners...Thank you Judit and Ignazio!! I don't remember having advertised a schooner in the site before - and what a cracker 'Lola' appears to be!